Remember that time I got to help with a cooking demonstration at A Southern Season? Well, I’m excited to be a part of another project with Sandra Gutierrez in celebration of her first cookbook: a virtual dinner party! I’m joined by fellow bloggers Robin Asbell (making layered potato and egg salad) and Dean McCord (making chile-chocolate brownies) for this week, with participants from the other weeks listed below. Respect, Sandra believes, begins in the kitchen. My respect for her began there, as well. She encompasses everything I love about being a part of the food community. Foodie people are happy people. These spiced pepitas certainly make me happy. This recipe is quite possibly the easiest I have ever posted on this blog, and I like to think that most of my recipes are easy. Cooking time is under 10 minutes, and the final product makes for an addictively healthy snack. A little bit salty, a little bit spicy, and undeniably easy to consume in large handfuls. Preheat the oven to 375 degrees. In a medium bowl, toss together the pumpkin seeds, lemon zest, lemon juice, salt, cumin, pepper, coriander, chile powder, cayenne, garlic powder, and sugar. Spread the mixture on a baking sheet. 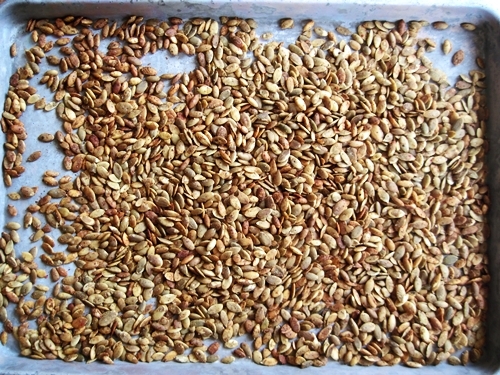 Bake for 5 minutes; remove the baking sheet and shake to redistribute the seeds. Return to the oven and bake for another 3 minutes; stop to shake the pan again. 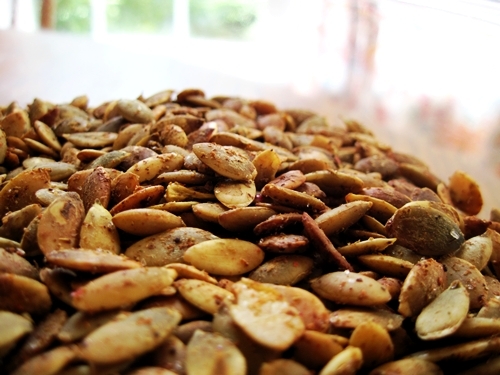 Finish baking for 1-2 minutes, or until the pumpkin seeds are crispy and golden, being careful not to burn them. Transfer to a cool baking sheet and cool completely before storing. Well, I have broadcast the news all over my favorite social media sites, but I have neglected to share my impending move on nestMeg. The fact is, between moving back to America, driving to New York City for interviews (thanks, Irene, for getting my flight cancelled! ), and navigating the tumultuous world of job negotiations, food preparation has not been on my mind. (Food consumption, however, occurred in a big way in NY. And is continuing, for that matter, in NC.) Hence, I haven’t cooked in quite a while, and I’m milking these last days of eating momma’s cooking for all they’re worth. Now that I have secured a job in Manhattan and an apartment in Brooklyn, I can safely say that I am going to fly the North Carolina coop in just under two weeks. I would be terrified, but I’m too busy being really excited about the future. Ask me again when winter comes. Despite being born two hours north of the city, I never imagined myself living in New York. I’d say the aversion to cold weather factored highly into that decision, as did my concern about being surrounded by so many oppressive skyscrapers. This summer, though, as I connected with my German roots, I realized that the greatest opportunity I could have to fully understand my heritage was waiting for me in NYC. 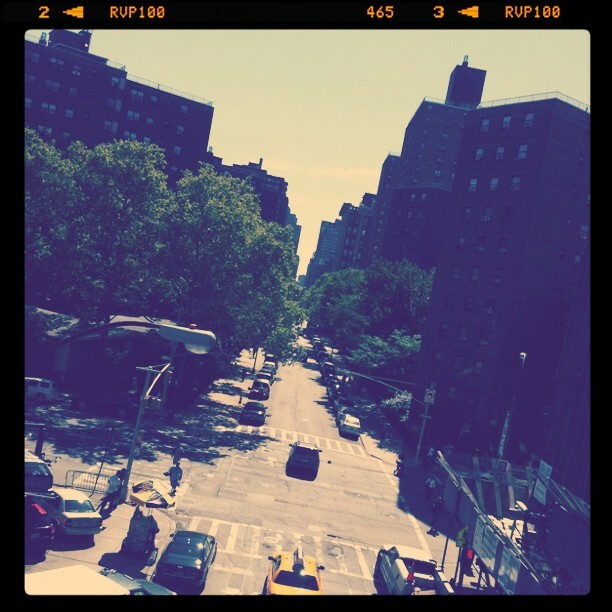 Those same streets, after all, played host to the dreams of my great grandparents, grandparents and parents. Why not mine? So, on the 10th anniversary of September 11th, a day that has come to define our generation, I find myself preparing to live in the city that never sleeps. And I couldn’t possibly feel more alive.